If you are a foodie, you can not ignore one of the food heavens in Vietnam, Hoi An. Hoi An is not only famous for its well-preserved architecture and traditional custom, but also well known for mouthwatering cuisines. One of the attractions of Hoi An is street foods, which you will fond of when tasting the first time. In addition, Hoi An foods can satisfy your empty stomach after long journey at reasonable cost. Now we will design a food tour in the heaven of cuisine as Hoi An. 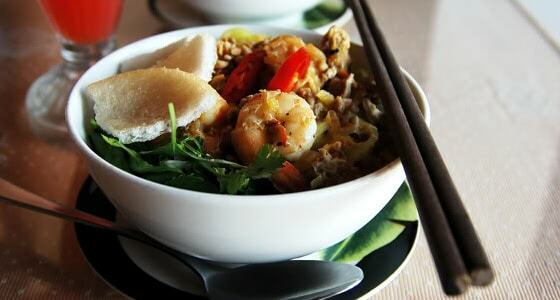 “Cao lầu” is one of the specialties of Hoi An, the first must try cuisine when getting to Hoi An. Despite of the appearance like noodles, Cao lau is not really a kind of noodles. 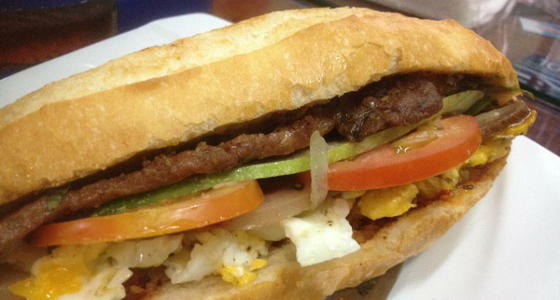 The origin of Cao Lau is also a mystery because people can not recognize it when compare to Chinese and Japanese food. Some people said it is from China but the Chinese do not consider it as their dish. Some said it may be a version of “udon” noodles from Japan. There was a tale about the special name of the dish. “Cao lau” in Vietnamese means high stage. The story about the “high stage” related to mercantile center of Hoi An. In the past, restaurants were designed to have second stage for diners who were mostly traders to enjoy food while keeping an eye on their goods, therefore, the noodle- like dish served frequently on the restaurants was named “Cao lau” (high stage). “Cao Lau” is artistic combination of noodles, meat and vegetables. But “Cao Lau” is not normally a kind of noodles, it is much more complicated. The fat light brown- yellow noodles are putting first in the bowl. Then slices of juicy pork, bean sprouts dipped over boiling water, herby greens and crispy croutons and salt soy sauce are spread on the bowl to make a culinary work. 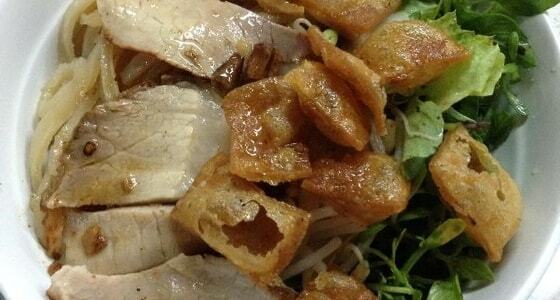 “Cao lau” brings the multiple favors of meat with chewy but crispy noodles and fresh greens. Though you can find “Cao lau” in many place in Vietnam, the Hoi An’s signature dish is much more incredible. The know-how of “Cao Lau” is believed to come from the ashes which use to soak the noodle being taken from Cu Lao Cham island, water from the ancient Ba Le well in Hoi An and greens from Tra Que vegetables village. With only $1 for a bowl of “Cao lau”, all your senses will be satisfied and your stomach will ask you to return Hoi An someday. The dish is really combination of chicken and rice. Why do so many people praise the food as unique Hoi An cuisine? The answer must be revealed when you come and taste by yourself. However, to give you something to imagine about the dish, all the ingredients are fussily cooked. The delicious fluffy rice is cooked in chicken broth and a small spoon of turmeric for attractive yellow color. Chicken chosen must be bird raised freely in the garden to make richer flavor than the soggy stuff in industrial agricultural facilities. Chicken is torn into small long pieces and then mashed with crushed onions, herbs and some spices for better absorption. The dish will be served with peppermint, shredded green papaya, pickled vegetables and a distinctive chili jam. Let close your eyes and imagine you are trying the first spoon. It is good balancing of sweet-sour-spicy-salty tastes. Open your eyes, you will see the harmony of light yellow rice and chicken, green herbs and dark red powdered chili, which is good eye-catching look. Traditionally, there will be an good sized spoonful of stewed innards along with chicken blood cake, ginger and garlic on the top for extra flavor, however, it is your choice having it or not. 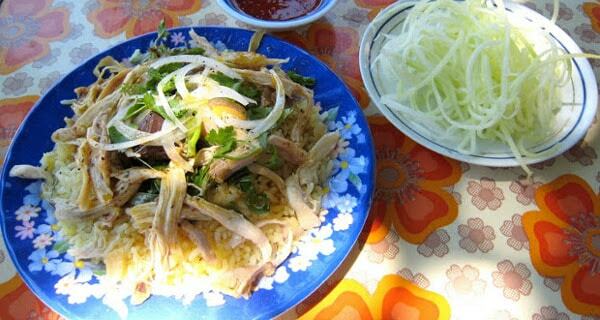 Chicken rice is said to be similar to the Hainanese dish, which was introduced by immigrants to Vietnam during the marine silk-road trading era. Again, it is the evidence of cross-culture of Hoi An, which is deservedly to be promoted as on of the Hoi An’s culinary specialty at affordable cost (less than $4 for a seat at restaurant). The name “Quang noodles” asserts that the food must be eaten in Quang Nam province for the best taste. Quang noodles also the evidence for the good balancing of Vietnamese cooking. The ingredients may vary, but peanut and “banh trang” are always found in every bowl of Quang noodles. The fragrant smell of roasted peanuts will invite you to come to the artistic work of Quang Nam citizen chef. Quang noodles can be easily found from the vendors to luxury restaurant. However, it is better to try a simple cuisine in a suitable context like a food stall on the pavement of the ancient town. On a small short table, even a stool, you will be offer a bowl with light yellow at the bottom, pork, shrimp, chicken, egg or even fish and beef on the second level. The broth is strongly flavored and only a little to wet the noodles. Finally, the bowl will be topped by green herbs to make the perfect picture. There are various greens to make the bowl so it is difficult for visitors to cook the dish at their home. You must have water mint, basil, Vietnamese coriander, sliced banana flower and lettuce to make the exactly taste of Quang noodles. A little roasted peanuts and sesame rice crackers are added to make your tongue the best experience of Vietnamese flavor. Quang Noodles is extremely mouthwatering that is worth eating not only one time but many times. “Banh mi”, a word in Oxford dictionary, is exactly Vietnamese bread that is recognized by the world as on of the most attractive street food. You will come across this delectable food when wandering in the street. You think “Banh mi” is a take away food for hurrying person? In Hoi An, where you can enjoy the low speed of life, “banh mi” is the cuisine accompanying with tourists when walking along the street. Banh mi Hoi An is something for slowing moving. You can not devour a loaf of bread but standing at the corner of the town to enjoy each bite. Banh mi is more than your expectation for a street food. The baguette is kept warm in the oven to maintain a crisp banh mi. Inside the baguette are the secret of fabulous banh mi, pork with liver pate and fresh vibrant-tasting herb mixture with lightly pickled julienned carrots and thinly sliced cucumber. The know-how to make the best banh mi in the world is homemade supper sauces to connect everything in a loaf of bread to make a symphony in a sandwich. 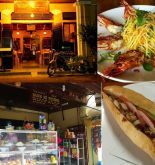 In Hoi An, it is so easy to find a place to try banh mi, but it is recommended to go to Banh Mi Phuong, where vacationers can find an additive harmony of flavor that bring Ms Phuong, owner of the food stall such a loyal following. It does cost only $1-2 for that street food so it can be said that Hoi An is really a heaven for food lovers to love food more than they can describe. Perhaps you are full of appetizing cuisine in Hoi An and you need to take a rest. Normally, we have dessert after the main course. In Hoi An, after you try several main courses, you can find a stool to have a small bowl of sweet corn tea. Whether or not you have a sweet tooth, you will fall in love with the cute bowl of corn soup. It is made from shaved kernels of young corn sourced from Cam Nam ward. The milk corns are steamed in sugar water until it is sticky and smell good. When serving, the sticky corn will be ladled out bowl then topped by a little coconut milk. The sweet taste is refreshing to cool down persons in tropical city in the hot summer. 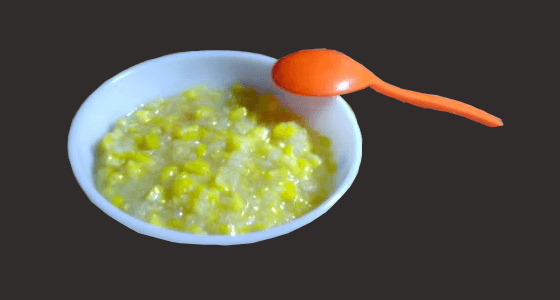 Even when the North East brings the chilly weather, a hot sweet corn soup can warm the whole body in the first spoon. There are a plenty of cuisine for vacationers to explore. Wonton, white rose, banh xeo, banh beo… No matter what tourists try, they find a story of Hoi An, receive friendly eyes and smiles from Hoi An local residents and a taste of Hoi An. And you want to make a food tour? Let’s take your luggage and go to Hoi An.